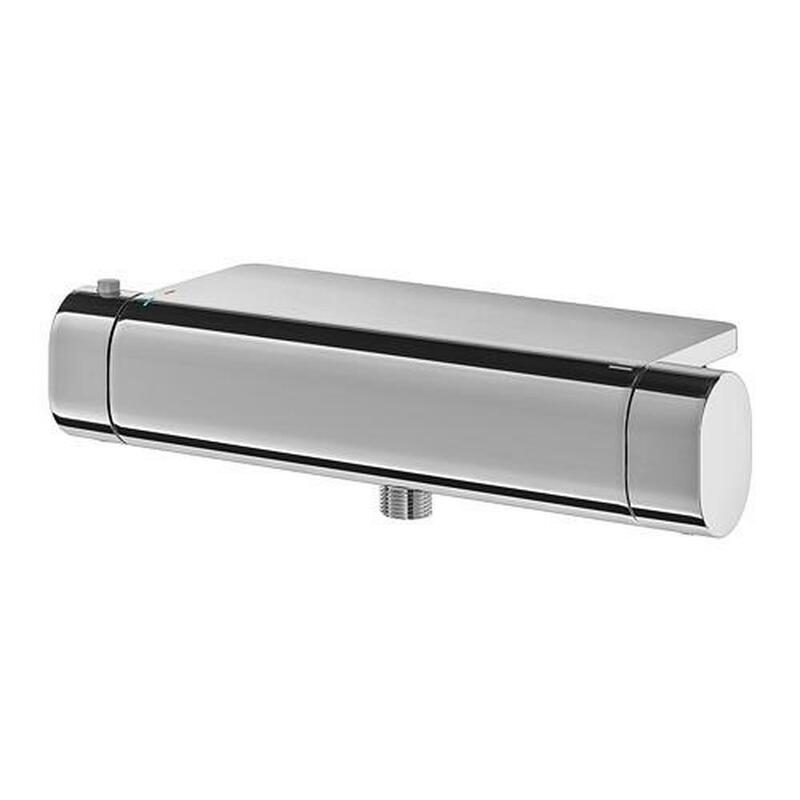 Durable chrome-plated brass surface is easy to clean. The mixer is set to a safe temperature limit: 38 ° C. To change the set safety temperature limit, click the adjust button. Thanks to a special technology, the mixer surface does not heat up, so it is absolutely safe to touch it. On the shelf integrated into the mixer, you can put shampoo and shower gel, which can be so difficult to find a comfortable place. From time to time, turn the thermostat from the maximum cold to the maximum hot position. Regularly check the thermostat, adjust if necessary in accordance with the assembly instructions. Separate adjustment of pressure and water temperature. You can change the set safe temperature limit by clicking the adjust button. Fixed distance between centers: 150 mm. 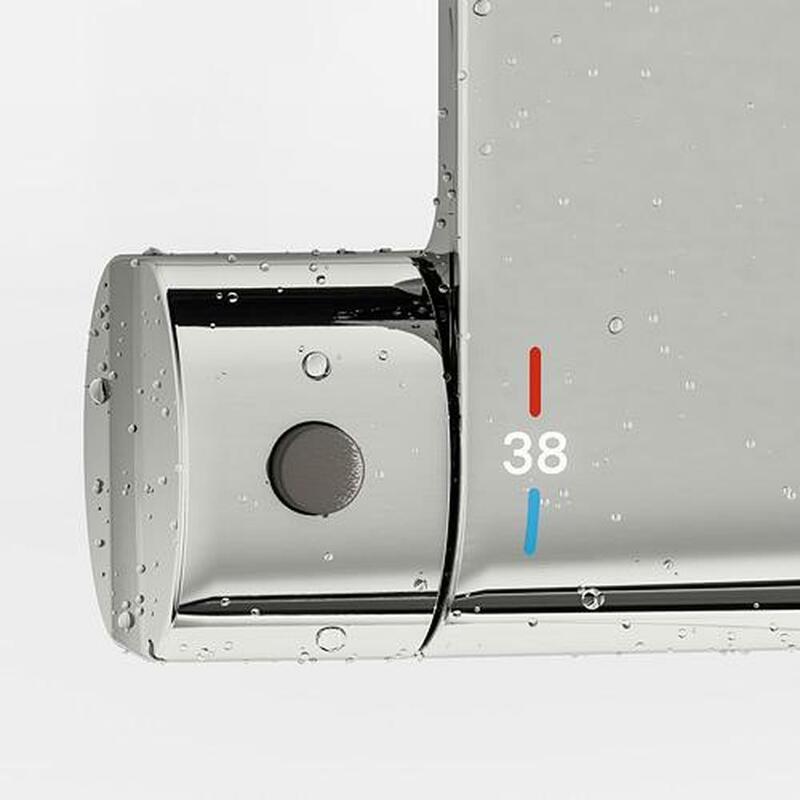 The thermostatic mixer is set to a safe temperature limit: 38 ° C. Since the operating conditions in each water supply system are different, it may be necessary to calibrate the mixer in accordance with the instructions. Recommended hot water temperature: 60 – 65 C / 140 – 149 F.
Recommended cold water temperature: 10 – 15 C / 50 – 59 F.
To extend the life of the product, some of its parts can be replaced. Read more - in the IKEA Service department or on the IKEA.ru website. 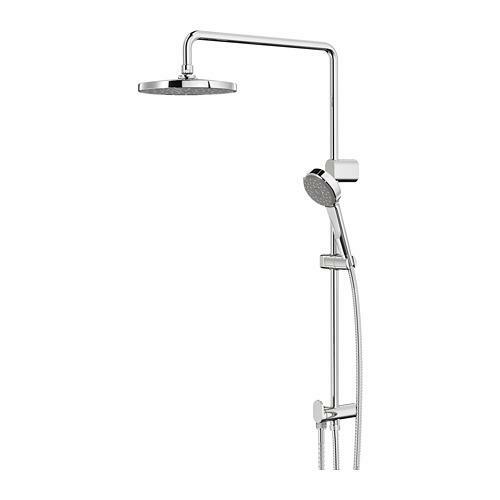 Thermostatic mixer can be used in high pressure systems. Withstands pressure max. 10 bar (1000 kPa). Recommended operating pressure: 1,0 – 5,0 bar (100 kPa – 500 kPa). Max. 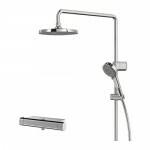 hot water temperature 80 ° C / 176 ° F.
It can be completed with an overhead shower and a hand shower or a shower rod with a hand shower. The minimum price for an 90 $ product in equivalent was fixed by 2019-04-07 in the country: Switzerland. The maximum price of an 209.92 $ product was equivalent to 2019-04-07 in the country: Jordan. Free 3 year warranty. Read more about the warranty conditions in the warranty brochure. The “continuous flow” mode of the overhead shower ensures an even distribution of water and creates a relaxing feeling of rain jets. 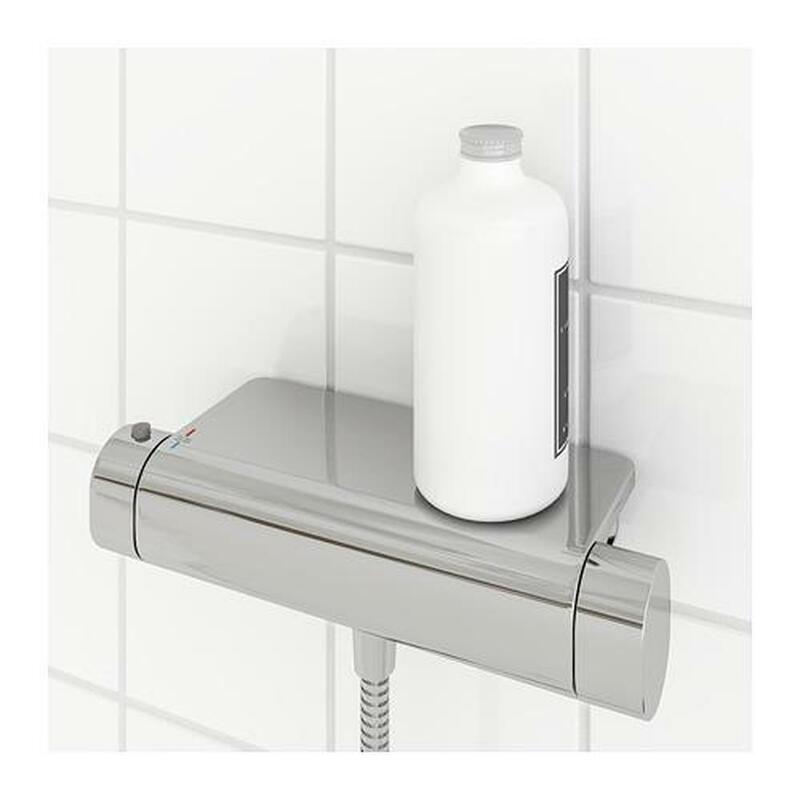 Hand shower with the "continuous flow" mode provides an even distribution of water for maximum comfort. 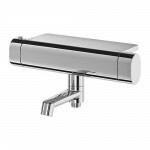 Hand shower is easy to set to the desired height with an adjustable holder. Free 3 year warranty. Read more about the warranty conditions in the warranty brochure. 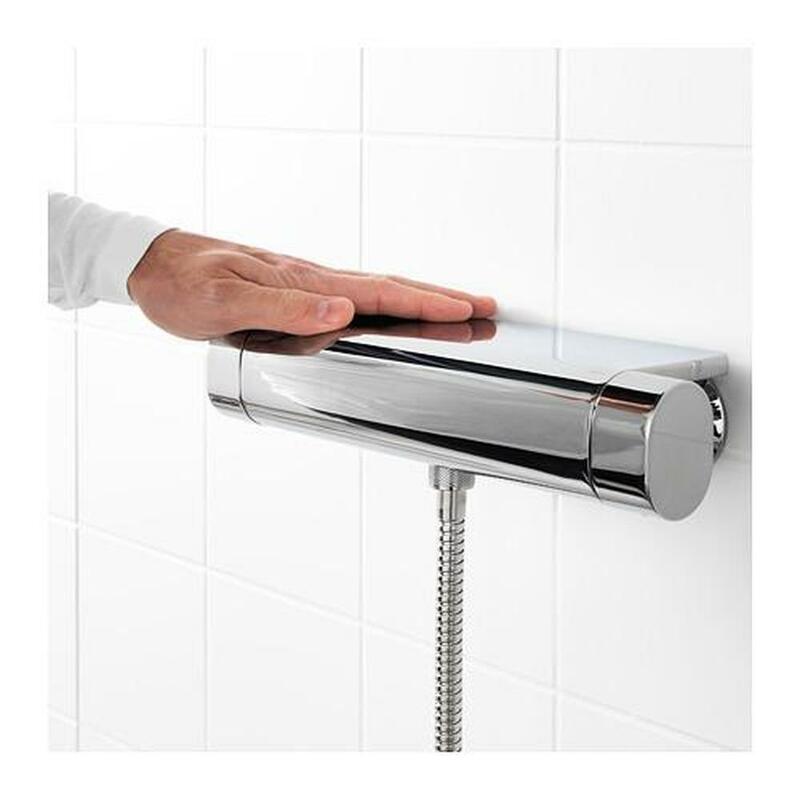 Hand shower with the "continuous flow" mode provides an even distribution of water for maximum comfort. 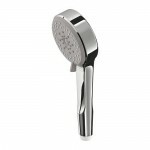 Shower mesh (rubber nozzles) watering can easily clean mechanically.